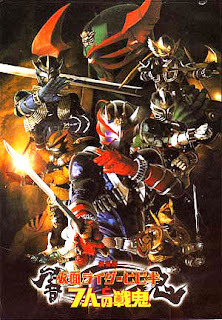 Kamen Rider Hibiki (仮面ライダー響鬼（ヒビキ） Kamen Raidā Hibiki?, Masked Rider Hibiki) is a Japanese tokusatsu superhero television series. It is the fifteenth installment in the popular Kamen Rider Series of tokusatsu programs. It is a joint collaboration between Ishimori Productions and Toei.Kamen Rider Hibiki first aired on January 30, 2005 and aired its final episode on January 22, 2006. This series is noted for introducing new themes and styles yet unseen in other shows. The catchphrase for the series is "To us, there are heroes." (ぼくたちには、ヒーローがいる Bokutachi ni wa, hīrō ga iru? ).